It’s only once or twice a year — in July or August — that I can be found steaming a pot of potatoes, and it’s always expressly for the purpose of potato salad. The remainder of the year, I’d rather enjoy them fried, roasted, sliced impossibly thin and swimming in cheese; please hold the mash. With such little practice, every time makes me a bit nervous with a past as embarrassingly littered with memories of overflowing starchy water and potatoes rendered all-too-mushy-for-potato-salad-I-guess-we’re-having-mashed-potatoes-instead as mine. Hello, my name is Heather Sage and stovetop potatoes are my nemesis. With that said, I think I’ve finally gotten a Heather-proof method for steaming potatoes down, but feel free to sub your favorite approach. Of course this makes me happy because (a) I love this crunchy, dilly, slightly sweet-yet-tangy, picnic-perfect salad and (b) I’m tired of scouring my pots and stovetop after yet another potato-fail (I mean, I already hate cleaning up after successful recipes, but it comes with the territory). Hooray progress! I originally intended to add some celery, but forgot. It wasn’t missed at all since there’s enough textural contrast between the crisp cornichon/shallot/pops of whole mustard seed and the tender potatoes. Feel free to add up to about 1/4 cup of very finely chopped celery (large chunks are a little overwhelming for my taste, but whatever you like). Place steamer basket in the bottom of a medium (4-quart) saucepan; fill pot with water, just below the bottom of the basket. Place potatoes in basket, turn burner to high and heat (uncovered) until the water boils. Cover and reduce heat to medium. (Don’t leave unattended just in case the water got too starchy and it begins to overflow. If this happens, all’s not lost, just leave the lid slightly ajar.) Cook for 15 – 20 minutes or until tender. Rinse potatoes with plenty of cold water to stop cooking; drain very well and set aside. While potatoes steam, prepare dressing. Halve hardboiled eggs, pop yolks into a small bowl and set aside whites. Crumble egg yolks and mix with mayonnaise, mustard and vinegar until smooth. Stir in cornichon, shallot, salt and pepper. Cut each of the egg white halves into 4-6 pieces, place in a large mixing bowl. 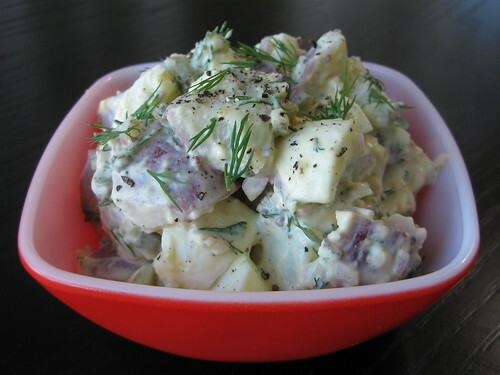 Add steamed potatoes to bowl, pour dressing over top and fold until evenly coated. Transfer to a shallow storage container (an 8×8″ glass dish works well) or serving dish, cover with plastic wrap and/or lid and refrigerate for several hours before serving — that way the potatoes will soak up some of the dressing and the flavors will meld. Give it a gentle stir and garnish with an extra sprinkle of dill before serving. ¹ Preferably full-fat. Store-bought is safer for a picnic where the salad will be left out unrefrigerated, but homemade works, too. If you go with the latter, just make sure to let any guests know that raw eggs were used because there’s an increased risk of foodborne illness, especially if they have certain medical conditions.